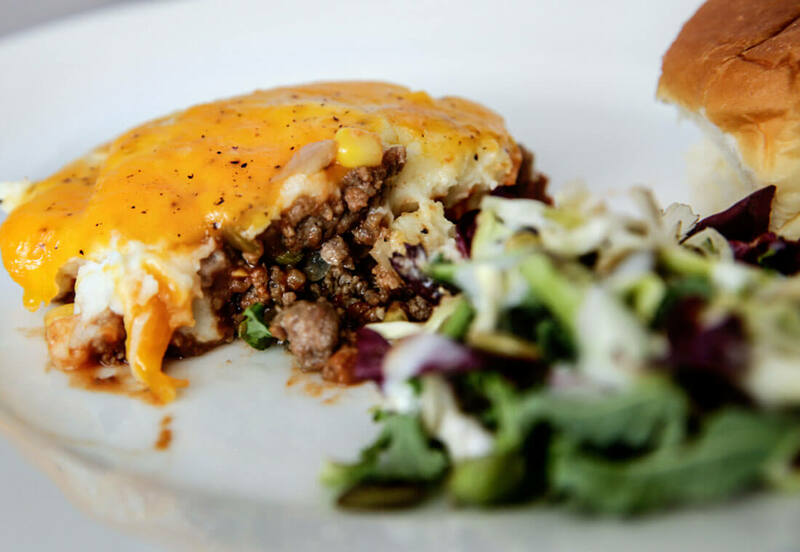 The ultimate comfort food, this Shepards Pie is not only easy to make, filling but also everyone your family will love. This is one of the recipes that I looked forward to my mom making when I was growing up. It is ultimate comfort food to me. 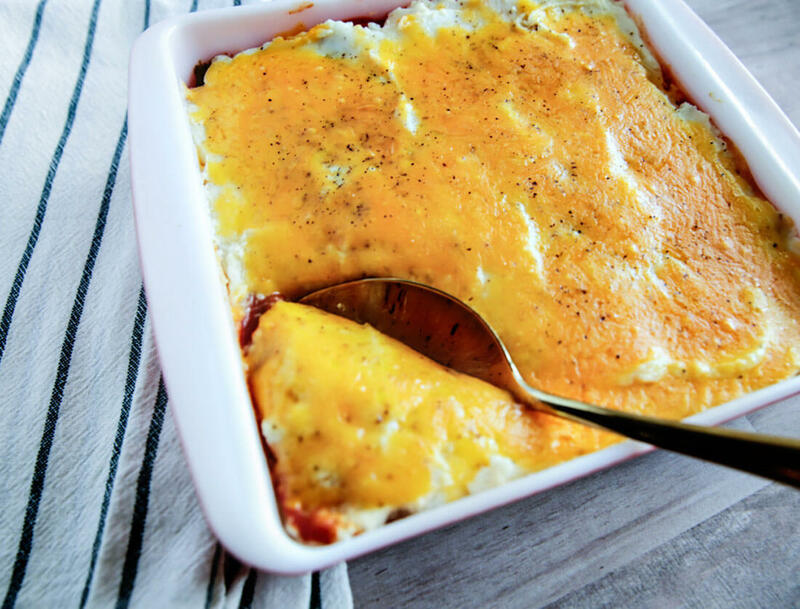 You can’t get much better than layers of meat, vegetables, mashed potatoes and cheese. It’s also very simple to make and a great way to use up leftover meat, veggies or mashed potatoes. 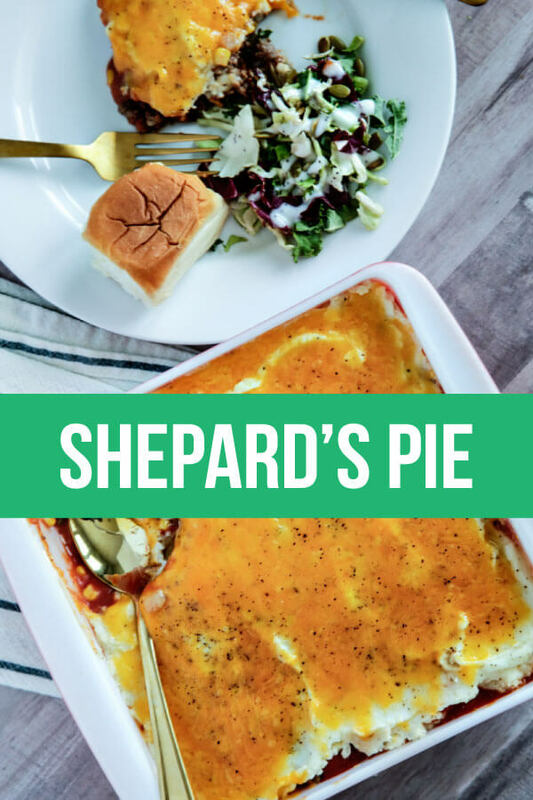 What is shepards pie/sheperd’s pie? 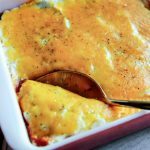 Where does the term shepards pie come from? It’s spelled two different ways but is the same thing and usually refers to minced meat, cooked in a gravy or sauce with onions, vegetables, topped with mashed potatoes. This version is a little different in that ground beef is used instead of lamb as it was in the olden days. While there are lots of varieties, this is one on that I grew up on and look forward to making and eating! Chop a half of a yellow onion. Add some butter into a saucepan and stir in the onions, letting cook until they soften. This should take about 5 minutes. Add in ground beef, stir and let brown. Transfer the onions and ground beef into an 8×8 casserole dish. This recipe can be doubled and served in a 9×13 casserole dish for more people. Season those vegetables with salt and pepper. Spread tomato soup over the vegetables. Top with mashed potatoes. I like to use my cake spatula to do this. Sometimes it’s a pain to spread mashed potatoes over the other layers and using a cake spatula seems to spread easier. Use my slow cooker mashed potato recipe or Bob Evans has a really good one. I don’t like boxed mashed potatoes so avoid them if you can. 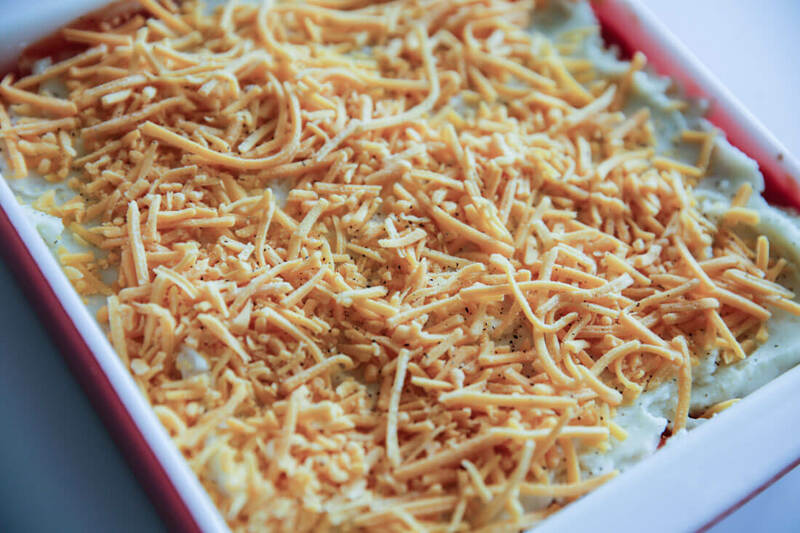 Bake at 350 degrees for 30 minutes, then take foil off and cook another 5 minutes until cheese is melted. Get exact measurements and directions below! 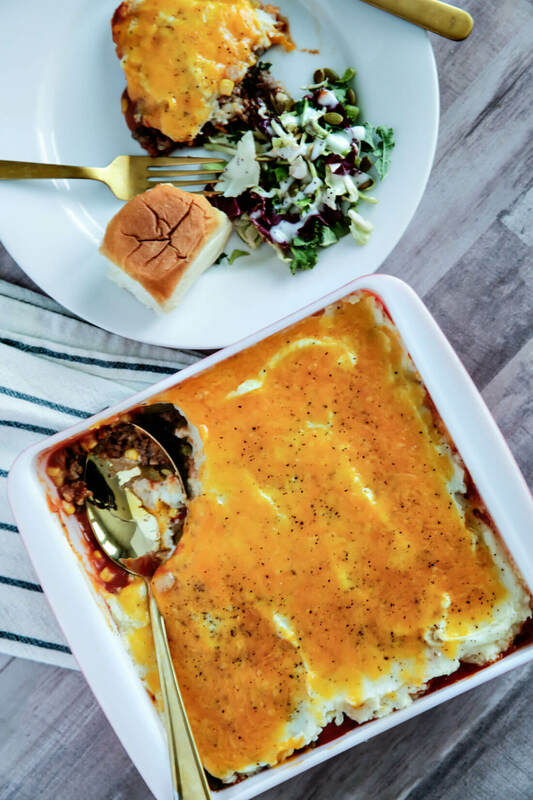 The ultimate comfort food, this Shepards Pie is not only easy to make and filling but also everyone your family will love! Add chopped yellow onion to sauce pan and let soften (about 5 minutes). Add ground beef and brown. Drain. Place on bottom on 8x8 dish. Top with green beans and corn. Spread tomato soup over vegetables. 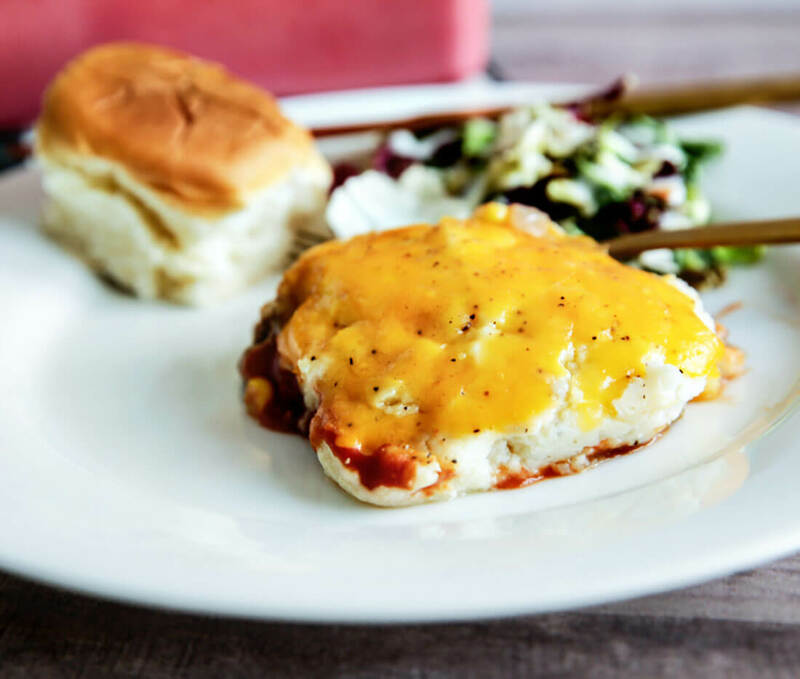 Take foil off and bake another 5 minutes until cheese is fully melted.